Many first responders were on the scene Monday at a fatal traffic crash at the US Route 62/State Route 753 intersection. One man was killed and two local residents were critically injured, according to Fayette County Sheriff Vernon Stanforth. WASHINGTON C.H. 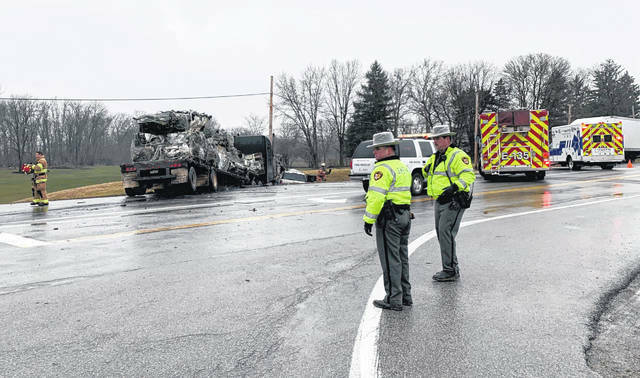 — A Greenfield man was killed and two Fayette County residents were critically injured Monday afternoon in a two-vehicle accident involving a semi at the intersection of US Route 62 NE and State Route 753. At about 2 p.m., a 1999 Freightliner semi tractor-trailer was heading northbound on US 62, and as it approached the intersection just north of Washington Court House, the driver — Richard Pierson, 50, of Wilmington — allegedly failed to yield at a red traffic signal, according to Fayette County Sheriff Vernon Stanforth. The semi collided with a westbound 2002 Mercury SUV, driven by 40-year-old Allen Ursell, of Greenfield. The collision forced both vehicles off the roadway and into the ditch, Stanforth said. Ursell was pronounced dead at the scene by Fayette County Coroner Dr. Dennis Mesker. Passengers in Ursell’s vehicle — Shaun Rooker, 40, of Washington Court House and Alesha Bennett, 33, of Milledgeville — were critically injured in the crash and were transported to area trauma centers for medical treatment. Members of the Washington Fire Department extricated the individuals from Ursell’s vehicle and also provided haz-mat assistance due to a large amount of fluids on the roadway. Also assisting at the scene were first responders from Fayette County EMS, the sheriff’s rescue unit, the Wayne Township Fire Department, and Fayette County Emergency Management Agency Director Melissa Havens. As of Monday evening, the US Route 62 and State Route 753 intersection remains partially restricted to thru-traffic as members of the Sheriff’s Traffic Crash Reconstruction Unit continued their investigation of the crash. https://www.recordherald.com/wp-content/uploads/sites/27/2019/03/web1_received_425463838228247-1.jpgMany first responders were on the scene Monday at a fatal traffic crash at the US Route 62/State Route 753 intersection. One man was killed and two local residents were critically injured, according to Fayette County Sheriff Vernon Stanforth.